Chelsea could reportedly be given fresh hope of prising Daniele Rugani away from Juventus as he’s taking English lessons. As noted by Goal.com, the 24-year-old was touted as a €50m target for the Blues this past summer, with Maurizio Sarri eyeing a reunion after their previous stint working together at Empoli. While a move failed to materialise, Rugani has struggled to make an impact for the Turin giants so far this season, making just three appearances in all competitions. The return of Leonardo Bonucci from AC Milan to the ongoing quality shown by veterans Giorgio Chiellini and Andrea Barzagli, it’s difficult to see his situation changing in the near future and so it remains to be seen if he has the patience to bide his time and step in when that veteran trio pass on the torch. However, Calciomercato reiterate that Chelsea and Arsenal are interested in the defender and as seen in his partner’s Instagram post below, Rugani is taking English lessons and it could be a hint over his future plans if a move to Chelsea and the Premier League is still an option next year. It must be noted that it could ultimately just be a personal choice for the defensive ace, but given the speculation over his future, it could perhaps be more than a mere coincidence. Chelsea have made a fine start to life under Sarri as they remain unbeaten in all competitions and sit just two points adrift of leaders Man City in the title race. 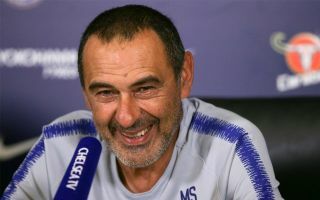 Further, they’ve conceded just eight goals in 11 league games, giving them the third best defensive record in the Premier League, and with the likes of David Luiz and Antonio Rudiger playing key roles, it would appear as though Sarri has found his solution without signing new players. Nevertheless, a move for Rugani could be revisited next year especially with Luiz’s contract set to expire in the summer, and the fact that he’s learning English could potentially be in preparation for a move to Stamford Bridge or somewhere else in the Premier League.